Join us for a Twitter chat on Monday, April 1st at 7:00pm! Let's talk about "What Powers Your Library?" and show how we are truly Agents of Change for our students, schools and communities! Although I have worked as the librarian for Newfields Elementary School for 5 years, I had not attended a NHSLMA event prior to the 2019 Agents of Change conference. For someone who works alone at her school and rarely gets to see her colleague librarians in SAU16, being with 200+ school media specialists from around New Hampshire was wonderful. I didn't feel so isolated! I was thrilled to meet new people who have similar questions, challenges, and joys from our jobs working with children. The two librarian keynote speakers spoke as our colleagues. Shannon Miller offered inspirational stories of making digital connections for her students with people in her community and around the world, including famous authors like Mercer Mayer. She stressed the importance of listening to each child and encouraging them to express their passions, especially students who may have trouble socializing with peers. Simple acts like making Facebook pages to publicize a child's art work or allowing a high schooler to instruct others in 3D printing made a major impact on these students' lives. She emphasized how big things (international charitable projects!) can come from small gestures, ideas, and plans. Diana Rendina gave many practical ways to enrich student experiences using STEM resources and makerspaces. These opportunities can begin in small spaces with small budgets. Students gain from being part of a community, working with partners, and being encouraged to explore, and allowing themselves to fail. The two author keynote speakers offered personal insight into the works that many of us have read. Rob Buyea described himself as an active child who pursued wrestling but left it to begin a teaching career. He incorporated many of his lessons as a male teacher into his first novel, Because of Mr. Terupt. He was a child who did not really read, but he blossomed into an adult who appreciates the richness of learning. His work shows his empathy with children who are more than two-dimensional bullies or jokesters or "mean girls". Everyone has a story, and knowing their story helps others understand difficult behavior. He emphasized how unknown readers' lives may be changed and improved by reading an author's work, showing his audience how parallels to Mr. Terupt's story inspired a critically ill male teacher to fight a cancer diagnosis. Books can make a difference and change peoples' lives. Jarrett Krosoczka, author of the Lunch Lady series and Hey Kiddo, his autobiographical graphic novel, spoke about his childhood. His favorite reading matter were comic books about super heroes. He, too, was less interested in reading "real books". His love of drawing lead him into creating picture books before publishers took a chance on Lunch Lady, inspired by his visit to his former elementary school in Worcester, MA, where he visited a "lunch lady" he remembered as a child. Marrying text boxes and illustrations into a long-form story was a novel way to make a book for children in the early 2000s. Lunch Lady was printed in black and white tones with yellow (representing iconic cleaning gloves) to save the publisher money in this gamble. His series was one of the first to start the graphic novel craze for children. He only lately has discussed his childhood as the son of a heroin-addicted mother and absent father; his reluctance to share this story has evolved. He now shares his experiences so that others may feel connections and know they are not alone; everywhere he goes he meets people who may never read Lunch Lady or Punk Farm but who feel deeply the humanity and suffering and ultimate hope of his family's story. I attended break-out sessions on "Unpacking the Standards" of AASL that are guidelines for 21st century librarianship. Though daunting in their breadth and scope, we can all use them as guidelines to improve our practice and make changes that benefit our students. "Innovation on a Tight Budget with Limited Time" showed us some easy and cheap ways to engage students with hands-on learning in ways that go beyond regular library activity. Chris Rose introduced his audience to some new spring titles in middle grade reader and picture book format. Pam Harland encouraged librarians to be leaders in their schools by working on enhancing our relationships with teachers, making ourselves more prominent in school communities, and taking pride in what we do. Sam Dixon gave a compelling and well-illustrated history of graphic novels, from "comics" to today's range of titles and how they can be used with students who are reluctant or resistant readers in place of more traditional novels or non-fiction. Each session I attended offered opportunities to learn from colleagues and hear others' approaches to problems. This was invaluable. I appreciated the thoughtful planning that went into the conference, the availability of vendors, the excellent meals, the perfectly suited venue, and the collegiality of fellow librarians. Thank you so much for the opportunity to attend, for the scholarship, and for the planning committee's dedication. I have been a School Library Media Specialist for ten years but this is my first year working in New Hampshire. I was fortunate to receive a scholarship to attend the Agents of Change NHSLMA conference last weekend. This was my first conference in New Hampshire though I have attended many conferences elsewhere. It was a powerful event. I listened to Shannon McClintock Miller discuss how important student voice is. I have many ideas just from her presentation alone. I thoroughly enjoyed the presentations by Rob Buyea and Jarret Krosoczka. Listening to them talk about their journey to becoming authors was a treat. The final keynote speaker, Diana Rendina, was also informative. There were many great workshops to choose from and I had the difficult job of deciding which ones to attend. I am fortunate that my colleagues in my SAU were also at the conference with me. We discussed who would go to which and report back. I visited workshops on librarian leadership by Pam Harland and Future Ready Librarians by Shannon Miller. I also learned new ways to promote reading from Nancy Keane in Tech Savvy Reading Promotion. One workshop that was particularly helpful for me was by Angie Miller. Her workshop, Teaching Research Will Save the World, provided new resources to teach about fake news in research. I talked to vendors from PermaBound and Gum Drop books about an upcoming project for my library (students ordering books for the library) and both vendors agreed to come talk to my students next year. I have four new professional books to read- all written by presenters at this conference! This conference was very informative. The time spent with colleagues was amazing. I met many new librarians and have been invited to visit their libraries as well. I am looking forward to next year’s conference! 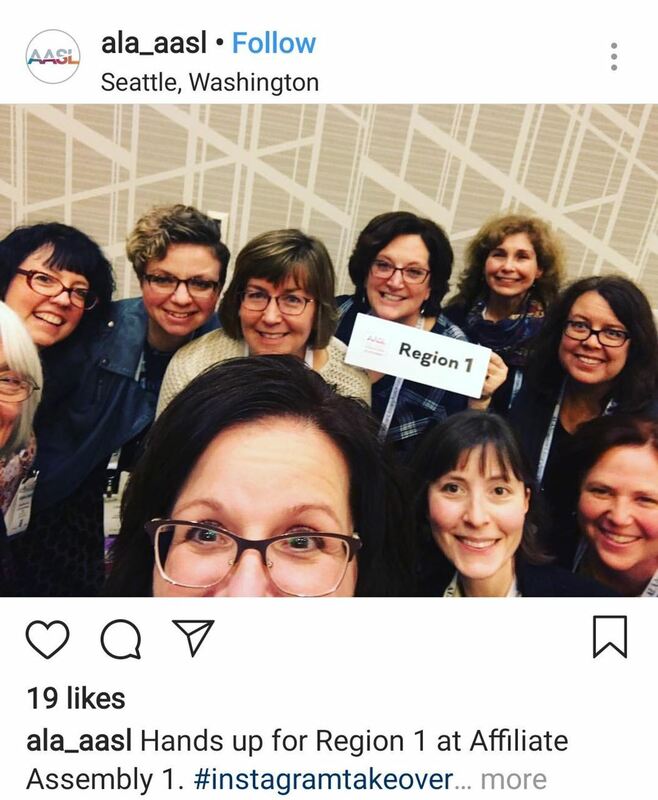 Seattle was an amazing city to visit and join in the fun at ALA Midwinter! So many highlights at this conference beginning with Melinda Gates as the opening speaker; did you know that The Gates Library Foundation has provided more than $1 billion to libraries around the world? Rick Steves debuted his new book Travel as a Political Act in which he talks about people being fearful of the world and explains how traveling allows us to gain understanding, alleviate fears and broaden our perspectives. An awesome moment for us was meeting Kwame Alexander (Justine got to ride the elevator with him in our hotel) as well as the many other authors speaking about their upcoming books. Throughout the conference, ALA promoted the importance of libraries with respect to equity, inclusivity and eradicating bias. There were several sessions focused on opportunities to push our communities forward, showcasing our libraries as examples of closing gaps on racial equity and disability access. The Libraries Transform: Social Innovation session discussed ways libraries have become safe havens for people experiencing homelessness. Emilio Estevez hosted two showings of his upcoming movie The Public which puts a spotlight on the role of compassionate public libraries serving marginalized populations. We highly recommend seeing this film if you have the opportunity and sharing it with others! Registration is now open for the 2019 AASL National Conference in Louisville, KY, November 14th- 16th. There is currently a $90 discount with the code AASL90, good through March 17th. You can register now, pay later and even bring an administrator for FREE! Keynote speakers include Ellen Oh and Jarret Kroscozka. Looking forward to seeing everyone at our NHSLMA Conference March 7th & 8th!! Have a plan for professional growth that aligns with an effective school library program. Are working toward a toward a school library degree or certification. Are willing to share what you have learned through a workshop, blog post, listserv discussion, or volunteering at a NHSLMA event. It is easy to apply; just fill out our application and provide one reference. All conference scholarships will be decided by January 25, 2019. We want to see YOU at our conference, so apply today! Opportunities to share the work you have done abound. Have you seen them? I am so excited by all of the conferences looking for our proposals. Yes, our proposals. If you have never presented, don’t doubt yourself. We all improve our practice and develop stronger relationships by giving back and sharing with the larger school community. For some of us, the idea of presenting to peers is daunting. The first time a close co-worker asked me to present my internal immediately dialogue took over. Who wants to hear from me? What have I really done? I can’t do that! What will they think? If you are uneasy, which we all are the first time we do anything, the best way to gain confidence and start developing your professional presentation is to find a co-presenter. Working with a co-presenter is empowers each team member. Over the past few years, I have encouraged classroom teachers to present. Throughout the school year I collaborate with teachers or administrators on projects that enhance student learning. As we reflect on and process our challenges and successes, trends emerge and we begin to consider the possibilities. The process allows us to give one another moral support as well as the confidence to present. Best of all, we consider the possibilities for our future projects. As you work further with this co-presenter, it becomes evident that real growth is fueled by the challenge of presenting at conferences. Your co-presenter will have a free day of trying something new, learning, and growing professionally. It opens their eyes to all the amazing things in their classrooms and the opportunities that are possible as they learn from others. For me, presenting fulfills my greatest passions: developing meaningful connections and reflecting upon my learning and extending my learning so that I can grow with my coworkers. The NHSLMA proposal deadline might be just around the corner but don’t let that deter you. A proposal is a rough outline of what you plan to deliver. This fall and winter make the time to delve deeper into your relationships and learning and celebrate your successes. Your library program could be our next award winner! Take a moment to reflect on your school library program. Is it a vital part of learning in your school? Are you leading the way in technology integration? Do you do anything special to promote reading? Are you collaborating with teachers? Have you transformed your library into a vibrant learning space? Do you encourage curiosity and creativity? If you answered yes to any of these questions, this may be your time to be recognized as the NHSLMA Outstanding School Library Program of the year. Step one is to take a look at our awards page here. Preview the questions on our online form and give it some consideration. Wouldn't it be amazing to have all of your hard work recognized? I trust that everyone enjoyed their summers. Perhaps you joined us at Library Camp, relaxed some, read a few great books, and enjoyed some well-deserved time off. 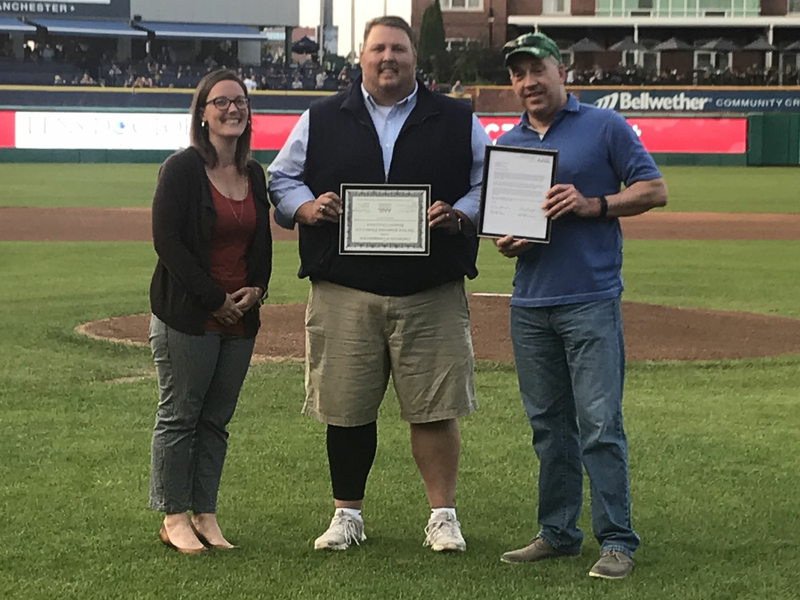 One of my highlights was presenting a AASL Commendation to the Fisher Cats and Velcro for the Fisher Cats Reading Challenge. We are so fortunate to have such a wonderful program in this state. Here I am on the mound with Mike Ramshaw, the Fisher Cats President, and Dirk Foreman, the North American President for Velcro. Now that we are closing the chapter on summer and beginning what will be a great fall, I wanted to welcome you to your new year and talk about the NHSLMA Board’s goals for this coming school year. The NHSLMA Board met for our annual retreat earlier this month. We welcomed three new Members-at-Large: Beth Kisel, Rachael Bowman, and Kiley Kapp. Emelia Fleck returned as a Member-at-Large. Etienne Vallee transitioned to our Membership Chair, as Cherie Smeltzer replaced Karen Abraham as our Awards Chair. Etienne will also be maintaining our website this year. Karen Landsman will continue to serve as our NHSTE Liaison, and she also took on the Center for the Book Rep. Audra Lewis will continue as our Standards and Certification Chair. Earlier last school year, Debbie Dutcher replaced Ann Hoey at the NH State Library and she will continue to serve as our NH State Library Rep. In addition to her role as our Past President, Rachel Hopkins will also lead our High School to College Subcommittee. Our Secretary Katie Gadwah will also wear another hat as our Future Ready Liaison. Justine Thain will be our Conference Chair for this year, and she is already hard at work with her amazing team planning the 2019 Conference. Helen Burnham continues as our Treasurer and Karen Abraham is our Vice President. We look forward to a wonderful year with our new and continuing board members. Fill Public Awareness Chair in June 2019. Each month the board will continue to keep our handbook updated and develop standard operating procedures. Last year, Rachel began to share the board meeting agenda to our members; this will continue this year. Additionally, we will use our website, listserv, blog, and social media to maintain communication between the board and membership. We will also use our blog, listserv, social media outlets, and Google Slides for members to share trusted, new, and/or innovative outreach methods. Professional development will continue to be a focus. The Annual Conference will make its return this March at the Grappone Center in Concord. Throughout the year, we hope to also offer other professional development opportunities, such as roundtables and online book discussions. Finally, through all of these measures, we hope to discover how to continue to support outreach at the board and membership levels, identify tasks for the Public Awareness Chair, and thus fill the position. We are thrilled to begin another year with everyone. Please contact any board member or myself with questions, comments, ideas, and concerns. A year ago, a series of bizarre, and fate ridden events changed my life. After working with my students on a Genius Hour project involving Zambia, an email on the NHSLMA list-serv came across my laptop looking for a elementary librarian in Lusaka, Zambia. My students had raised $3000.00 to support a circus school for extremely poor children located in Lusaka. Furthermore, this job had some connections to Plymouth State University, of which I was attending. Being a small town NH librarian for many years and working in education for thirty, had put me on a path of predictability, comfort, and stability. That all changed February 2017, when I applied and accepted the position of Primary Librarian at the American International School of Lusaka, Zambia. If you had asked me two years ago if I thought I would be living in Africa, I would have laughed. If you had asked me a year and a half ago if I would choose to give up my position at my NH school and stay in Zambia for 2 more years, I would have thought you were delusional. So what made me, someone who had never traveled internationally and always worked in my small community, jump on a plane to fly over 7,000 miles away and work in a city with over 2.7 million people? Two words: challenge and growth. I have always wanted my students to challenge themselves, become risk takers, and embrace change. I thought modeling this behavior was appropriate and overdue. Once I arrived in Zambia, I had no idea how very challenging the transition would be. Everything was new, and I mean everything. Aside from the personal and cultural challenges, every tech tool for documentation, all rules and protocols, the entire curriculum, and students from 42 different countries with names that were hard to pronounce were all unfamiliar to me. By far, the curriculum has been the most challenging component of this process. The International Baccalaureate (IB) Primary Years Program (PYP) curriculum is intricate, intense, and involved. Although I took a course before arriving, I found myself drowning in a curriculum with new vocabulary that was embedded in a well laid out format, but was quite dense. I was expected to have weekly library classes with students in preschool through 5th grade. However, I also was expected to work with my Tech. Integrator on a brand new pilot program of teaching during the point of need during Units of Inquiry. Meaning, during specific units, we went into classrooms to support and teach with the grade teams. At this point, I was still struggling with the curriculum and trying to learn what prior knowledge my students already had. Furthermore being an International School, students frequently move around. It is not unusual for students to stay for 2-4 years and move to another country. A significant amount of students will move during the school year. Within all of this, I needed to learn and promote the IB Learner Profile. To say I was overwhelmed at times, is an understatement. So why did I choose to stay? There are several reasons but the first is: Support. AISL values its teachers and staff and provides an amount of support I have never seen. With all the challenges, I knew that someone was always ready to assist me when I required it. Another reason is simply because this curriculum does inquiry right. Back in the States I was attempting to use student inquiry more in my lessons. Here, I am still wrapping my head around the process and have made some gains but there is still so much to learn. It has also given me perspective as a learner and acknowledging what a steep learning curve I am encountering makes me more empathic to the plight of students walking into a new classroom. I am constantly challenged, intrigued, and learning. These are things I want my students to do on a regular basis. I wish I had known about IB when I was developing my own program back in the States as implementing some if its techniques makes so much sense. Students engage in inquiry and problem solving like I have not witnessed before. The beauty of all of this is that although I am an IB PYP Librarian in Zambia, I must maintain my NH license so I am still a NH Librarian, and proud of it. I will say the support of NHSLMA is something I still count on heavily to help me through the challenges. Lastly, as I enter a new decade of my life, I am proof that you can teach an old dog new tricks.